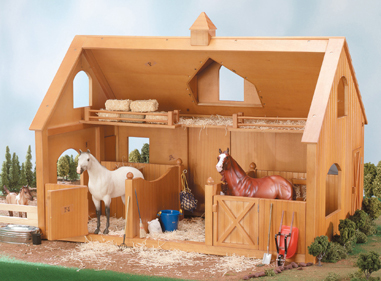 The deluxe barn fits up to two Traditional Series horses. Includes two stalls with mats and built-in feed bins, sliding doors, hay loft, saddle and bridle rack, and cross tie area. Made of natural wood. Assembled barn measures 30.5"L x 21"H x 18.5"D.